A 32-year-old-man presented with features of Fournier's gangrene, sepsis, anuria, seizures, and altered sensorium. He did not have any history of local trauma, comorbidity, or immunosupressed state. On examination, he was delirious and hypotensive. His hemoglobin was 6.8 g/ dl, total leukocyte count was 17900/ mm 3 , and serum creatinine was 7.7 mg/dl. After initial stabilization, he underwent surgical debridement. Intraoperatively, the right testis and spermatic cord were found to be gangrenous [Figure 1]a and hence were excised with the gangrenous hemiscrotum. 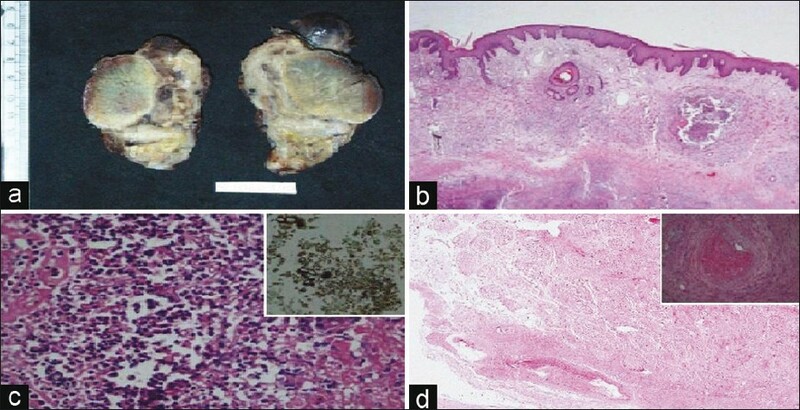 Histopathology showed mucormycosis of the scrotal skin involving the right spermatic cord with vascular thrombosis producing right testicular infarction [Figure 1]b-d. Intraoperative pus culture showed growth of mixed organisms. In the postoperative period, the patient was managed with intravenous broad-spectrum antibiotics and dialysis till improvement of renal function. He was evaluated for systemic mucormycosis including a thorough otorhinolaryngeological evaluation and contrast-enhanced computed tomography of the abdomen, both of which were normal. At 1 month follow-up, patient was doing well and the wound had healed well. Although the administration of appropriate antifungal agents is essential in systemic diseases caused by mucor, they are not essential in treating localized skin infections caused by this agent occurring in immunocompetent individuals infected by trauma, like Fournier's gangrene where prompt and adequate surgical debridement may prove sufficient to affect clinical cure. , In our patient also, only surgical debridement and supportive treatment for renal failure cured the patient. First, the etiologic agent, mucormycosis, has to our knowledge not yet been reported in world literature as a cause of Fournier gangrene. Second, contrary to the classical description, this patient had testicular gangrene which is most likely due to thrombosis of blood vessels of the testis due to involvement of the spermatic cord by the fungus. Mucormycosis should be considered a potential cause of these devastating perineal infections, especially in those with associated testicular gangrene. Third, it reinforces the fact that such invasive fungal infection can occur in immune-competent patients without any underlying predisposing factor. And fourth, it highlights the fact that surgical debridement alone without systemic antifungal therapy may prove sufficient for immunocompetent patients with localized forms of angioinvasive fungal infections. 1. Johnin K, Nakatoh M, Kadowaki T, Kushima M, Koizumi S, Okada Y. Fournier's gangrene caused by Candida species as the primary organism. Urology 2000;1:153. 2. Loulergue P, Mahe V, Bougnoux ME, Poiree S, Hot A, Lortholary O. Fournier's gangrene due to Candida glabrata. Med Mycol 2008;46:171-3. 3. Fidel PL, Jr, Vazquez JA, Sobel JD. Candida glabrata: Review of epidemiology, pathogenesis, and clinical disease with comparison to C. albicans. Clin Microbiol Rev 1999;1:80-96. 4. Roden MM, Zaoutis TE, Buchanan WL, Knudsen TA, Sarkisova TA, Schaufele RL, et al. Epidemiology and outcome of zygomycosis: A review of 929 reported cases. Clin Infect Dis 2005;41:634-53. 5. Padhye AA, Koshi G, Anandi V, Ponniah J, Sitaram V, Jacob M, et al. First case of subcutaneous zygomycosis caused by Saksenaea vasiformis in India. Diagn Microbiol Infect Dis 1988;9:69-77.